Last month China and the United Nations Economic and Social Commission for Asia and the Pacific (UNESCAP) have signed a cooperation document to promote the Belt and Road Initiative.The letter of intent was signed by Foreign Minister Wang Yi and visiting UNESCAP Executive Secretary Shamshad Akhtar in Beijing on April 11. According to the document, the two sides will jointly promote regional connectivity and the implementation of the Belt and Road Initiative. The Foreign Ministry spokesman Lu Kang noted that the letter of intent is the first document signed between China and an international organization on boosting cooperation under the Belt and Road Initiative, though China has signed cooperation deals with more than 30 countries in this regard. 2. Multilateral approaches to implementation will be key to ensure the smooth operation of hardware across a number of different policy regimes and across multiple borders. The global community and partner countries need to fully understand and endorse the objectives and goals of the Belt and Road Initiative to ensure the active and eager participation of all relevant countries in its implementation. 3. Corridors and cities must not be locked into unsustainable infrastructure and urbanization patterns. Development driven by natural resource extraction, with minimal social and environment concerns, are intrinsically unsustainable. 4. The Belt and Road Initiative projects need to generate sufficient returns on investment (ROI), covering the financial operating and maintenance costs. Operational and financial risk assessment procedures have to be rigorous at both investor and investee levels. To conclude, the Belt and Road Initiative is a visionary, long-term endeavor. It has the potential to reduce disparities within China, by connecting China’s inland areas to its neighboring subregions, and across Asia, by promoting regional connectivity and also creating new links with Europe. 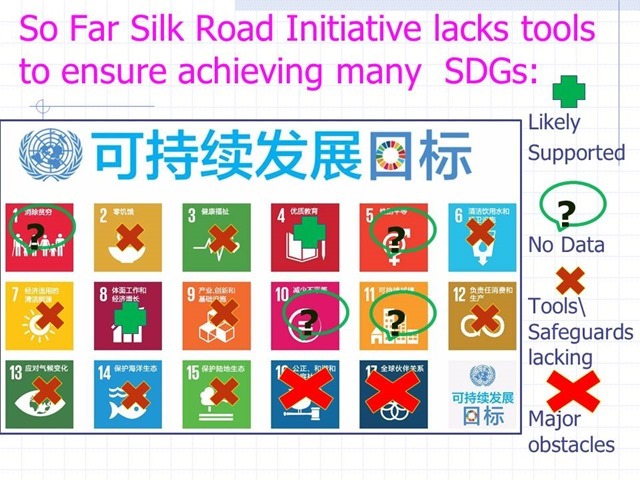 Recently the RwB analyzed likelihood that OBOR initiative positively contributes to implementation of 17 SDGs of 2030 Agenda and came to conclusion that it lacks tools and safeguards to achieve most of those goals. see picture below.